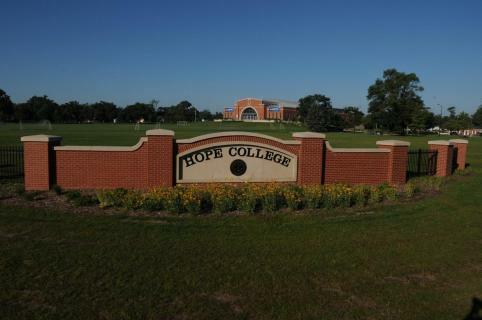 Numerous Hope students have received scholarships or honorable mention through the years. Across the past five years, for example, six have received scholarships and six have received honorable mention. Lunderberg is a chemistry major who is interested in pursuing a doctorate in analytical chemistry and subsequently conducting research into systemic environmental problems and teaching at the university level. He has been conducting collaborative research while at Hope within the college’s nuclear group, mentored by Dr. Graham Peaslee, who is the Elmer E. Hartgerink Professor of Chemistry, a Schaap Research Fellow and a professor of geology/environmental science; and Dr. Paul DeYoung, who is the Kenneth G. Herrick Professor of Physics. Earlier this year he also received recognition from Hope through a Beckman Scholars Program award that will provide support as he conducts research full-time during each of the next two summers and part-time during the 2015-16 school year. The funding is through an award to the college from the Arnold and Mabel Beckman Foundation that will support a total of four students in conducting collaborative research with faculty mentors across the next three years. Lunderberg is the son of Jon and Marla Lunderberg of Grandville, and a 2013 graduate of Grandville High School. The Goldwater Foundation is a federally endowed agency established by Public Law 99-661 on November 14, 1986. The Scholarship Program honoring Senator Barry M. Goldwater was designed to foster and encourage outstanding students to pursue careers in the fields of mathematics, the natural sciences and engineering. Since its first award in 1989, the Foundation has bestowed 7,428 scholarships worth approximately $48 million. The Trustees plan to award about 200 scholarships for the 2016-17 academic year.